Robotic surgery refers to a surgical procedure where surgeons use a computer to control small instruments attached to a robot. Hence, it is also known as computer guided minimally invasive surgery. The surgical robotic system includes surgeons console, surgical arms and monitoring system and software. The robotic surgery is an advanced technology that helps surgeons to perform complex surgeries with more accuracy and precision. This surgery ensures greater accuracy, enhanced motion range and provides better dexterity to surgeons. Further, the three-dimensional vision provided by the camera renders a more detailed view to the surgeons which, as a result, enhances the surgical outcome and the overall procedure. There was a growing demand for minimally invasive surgical techniques both from the patient and the doctor side. Generally, traditional minimally invasive laparoscopic surgical techniques are employed for region of interest in surgeries, but those techniques have their limitations of standard two-dimensional video and rigid instruments used by the surgeons. These instruments are incapable of providing high quality video of the affected region impose a difficulty in the case of complex surgeries. On the contrary, robotic surgery makes it easier for the surgeons to carry out complex procedures with comparatively much smaller incisions (0.5-1 mm). As a result, the global surgical robotics market is growing at an exponential rate. A surgical robot recurring revenue business model is essentially a large one-time purchase for a system complimented by the replaceable or disposable instruments that cumulatively make a much larger and sustainable ongoing market. In recurring revenue business model, the vendor makes money through one-time sale of the robotic system and then generates recurring revenue from the sale of equipment and accessory products, and maintenance services used in the robotic system. Surgical robots increase the accuracy of surgeons while reducing the risk to the patients. For instance, heart bypass surgery requires patient’s chest to be opened by making a long incision. The surgeon first cuts through skin, then tissue and muscle, then fascia, and then reaches the heart. However, through non-invasive surgical robots it becomes easy to perform critical surgeries with minimal incision and high accuracy. Surgical robots have several advantages such as decrease in post-operative pain, decreased risk of infection, and decreased blood loss. These robots provide effective representations of body parts and increase dexterity, which aids the surgeons while working on inaccessible body parts and offer shorter recovery time and leave lesser scars in comparison to the traditional open surgery. The advancements in robotic surgery systems make them capable of replicating the tactile feel and sensation, which a surgeon experiences during the more invasive traditional procedures. Consequently, this enables the surgeons gain the precision and advantages of minimally invasive procedures without losing the sensory information that is helpful in making the correct judgment during the robotic surgery. The global surgical robotics market is expected to reach $11.65 billion by 2025. The market report presents a detailed and investigative study of the entire market and provides a comprehensive insight into various forms of development, trends and the key market participants. While highlighting the key driving and restraining forces for this dynamic market, the report also provides a comprehensive section on competitive landscape, market share analysis, competitive benchmarking, and the position of the competitors within the global surgical robotics market. This research study includes an extensive analysis of the global surgical robotics market by product, application, end-user and geographical regions, allowing the researcher to develop a comprehensive outlook of the market. Each of these segments have been analyzed on the basis of their current and future market size, considering the macro and micro environmental factors. 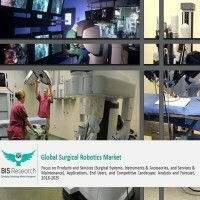 The key players who have significant contributions to the surgical robotics market are Intuitive Surgical Inc., Stryker Corporation, Mazor Robotics, Hansen Medical Inc., MedRobotics, TransEnterix Inc., Accuray Inc., Renishaw plc, Think Surgical, Synaptive Medical, Titan Medical Inc. and Smith & Nephew plc, among others. • What are the major market drivers, challenges and opportunities of the global surgical robotics market? • How did the minimally invasive robot assistive surgical procedures evolve and what is its scope in the future? • What were the market shares by value of the leading segments and sub-segments of the global surgical robotics market in 2017 and what will be the shares in 2025? • What were the market shares by volume of the leading segments and sub-segments of the global surgical robotics market in 2017 and what will be the shares in 2025? • How will each of the segments of the global surgical robotics market by value grow during the forecast period and what will be the revenue generated by each of the segments by the end of 2025? • How will each of the segments of the global surgical robotics market by volume grow during the forecast period and what will be the installation volume or procedural volume respectively by each of the segment by the end of 2025? • How did the market share of the leading companies change in 2016 and which country will lead the market in 2017? • How will the surgical robotics industry evolve during the forecast period 2018-2025? • Which product, application and end-user will dominate the global surgical robotics market by the end of the forecast period, and which one is growing at the highest CAGR during the forecast period 2018-2025? • What will be the growth rate of different segments during the forecast period? Which is the leading segment by product, imaging modality, application, and end-user? • Who are the key players in the global surgical robotics market? • Which region will lead the global surgical robotics market in revenue generation through the forecast period? • Which region will lead the global surgical robotics market in surgical systems installation volume throughout the forecast period? 9.4 Corindus Vascular Robotics, Inc.
47 Recent Developments: Accuray Inc.
49 Overview: Auris Health, Inc.
50 Recent Developments: Auris Health, Inc.
51 Overview: CMR Surgical Ltd.
53 Overview: Corindus Vascular Robotics, Inc.
54 Recent Developments: Corindus Vascular Robotics, Inc.
55 Overview: Intuitive Surgical Inc.
56 Recent Developments: Intuitive Surgical Inc.
57 Overview: Mazor Robotics Ltd.
58 Recent Developments: Mazor Robotics Ltd.
61 Overview: Zimmer Biomet Holdings, Inc.
63 Recent Developments: Zimmer Biomet Holdings, Inc.
66 Overview: Mimic Technologies, Inc.
68 Overview: Restoration Robotics, Inc.
69 Recent Developments: Restoration Robotics, Inc.
74 Overview: Synaptive Medical Inc.
75 Recent Developments: Synaptive Medical Inc.
76 Overview: Think Surgical, Inc.
77 Recent Developments: Think Surgical, Inc.
78 Overview: Titan Medical Inc.
79 Recent Developments: Titan Medical Inc.
81 Recent Developments: TransEnterix Inc.
84 Overview: Verb Surgical Inc.
85 Recent Developments: Verb Surgical Inc.
98 Surgical Robots Sold Units in the U.S.
99 Surgical Robots Cumulative Installed Base in the U.S. The medical industry, globally, has witnessed several technological advancements in the recent years in diversified branches. For instance, previously, surgeries were done by using open surgical procedures, which witnessed a noteworthy transformation when minimally invasive surgical procedures were introduced in the medical world. Medical robotics and computer assisted surgical systems stood distinctively as the most advanced extension of minimally invasive surgical procedures. These systems can be segmented into three types: rehabilitation systems, hospitals and pharmacy systems, and surgical robotics system. Among these, the surgical robotics systems are being widely adopted across the globe at present. Surgical robots increase the accuracy of surgeons while reducing the risk to the patients. For instance, heart bypass surgery requires the patient’s chest to be opened by making a long incision. The surgeon first cuts through skin, then tissue and muscle, then fascia, and then reaches the heart. However, through non-invasive surgical robots it becomes easy to perform critical surgeries with minimal incision and high accuracy. Surgical robots have several advantages such as decrease in post-operative pain, reduced risk of infection, and less blood loss. They provide effective representations of body parts and increase dexterity which aid the surgeons while working on inaccessible body parts. They also offer shorter recovery time and leave lesser scars as compared to the traditional open surgery. Factors such as rising demand of minimally invasive surgeries, rising incidence rate of chronic diseases, general awareness regarding computer aided surgeries, rising disposable income and introduction of technologically advanced systems, such as SurgiBot, Amadeus, Single Port Orifice Robotic Technology (SPORT), and Modus V, among others, are propelling the growth of this market. With the rising incidence rate of chronic diseases and due to continuous technological advancements in medical surgeries, the demand for minimally invasive surgeries and miniature robotics is growing. As per the current scenario, the high costs of robotic systems hinder the adoption of surgical robotics systems among the hospital and ambulatory surgical centers. However, with technological innovation and increasing demand for low cost surgical systems from end users, the price is likely to decrease during the forecast period. Rising incidences of colorectal cancer, neurological disorders, interventional cardiology disorders and gynecological diseases, growing geriatric population, and active participation of the government and the industry players in the technological advancement in the field of computer assisted robotic surgeries have boosted the overall growth of this market. Another factor responsible for sustainable growth of the market is the recurring revenue model. In recurring revenue business model, the vendor makes money first through one-time sale of the robotic system and then generates recurring revenue from the sale of equipment and accessory products and maintenance services used in the robotic system. Furthermore, the lack of clinical evidences on the efficacy of surgical robotic systems serves as a challenge for the market players to get regulatory approvals and clearance. However, newly established players are putting efforts to get necessary regulatory clearance to enter into the market and bring in clinical evidence in order to increase the adoption rate of surgical systems in the near future. The market consists of various product segments such as surgical systems, instruments and accessories and maintenance services. The instruments and accessories segment had the highest market value in 2017, growing at the CAGR of 15.54% during the forecast period 2018-2025. However, services (maintenance and up-gradation) are expected to grow at the CAGR of 14.14% during the forecast period 2018-2025. All the major surgical robotics systems have been covered into the global surgical robotics market volume data. The market for surgical systems by value is expected to grow at the CAGR of 11.22% during the forecast period, 2018-2025. Among all surgical systems, the da Vinci surgical system accounted for the highest installation volume in 2017 and is anticipated to reach 8,005 installation units in 2025, growing at the CAGR of 7.72% during the forecast period. The growth can be attributed to the increasing adoption rate of da Vinci surgical robotics system for increasing rate of general surgeries, gynecology, urology, cardiothoracic and head and neck medical complications. However, the Sensei Robotic System manufactured by Hansen Medical (Auris Surgical Robots) is anticipated to grow at the highest CAGR of 22% during the forecast period. The application segment of the market consists of general surgery, gynecology, urology, orthopedics, interventional cardiology, and neurology, among others. The gynecology segment acquired the highest market value in 2017 and is expected to grow at the CAGR of 7.0% during the forecast period 2018-2025. This can be attributed to the increasing incidence rate of gynecological complications among women globally and continuous technological advancement in robotic systems. However, General Surgery is expected to be dominant with revenue generation of $5.49 billion by 2025. Also, the segment is expected to witness the highest growth rate of 20.30% during the forecast period 2018-2025. Based on the application, gynecology accounted for the largest market share by robotic surgical procedural volume in 2017. The end-user segment comprises hospitals and ambulatory surgical centers and others. The hospitals accounted for the highest market value in 2017, growing at CAGR of 13.20% during the forecast period 2018-2025. However, the revenue generated by the ambulatory surgical center is anticipated to grow at the highest CAGR of 18.20% during the forecast period 2018-2025. Furthermore, based on the end-user, hospitals accounted for the largest market share by robotic surgical system installation volume in 2017 and it anticipated to reach 2,566 units by 2025. However, robotic surgical system installation volume at ambulatory surgical centers are estimated to grow at the highest CAGR of 17.2%. Some of the equipment and accessories of the robotic systems are required to be changed for each surgery. Consequently, the surgical robotics market has attracted considerable attention of the end-users and several new players have emerged in the market space. The geographical region consists of North America, Europe, Asia-Pacific, Latin America and Rest of the World (RoW). North America acquired the highest market value in 2017 and is anticipated to grow at the CAGR of 11.1% during the forecast period 2018-2025. The Asia-Pacific region (consisting of Japan, China, Australia, India and South Korea, among others) as well as Latin America (consisting of Brazil and Mexico, among others) are each expected to register a high growth rate during the forecast period 2018-2025. Based on the geography, North America accounted for the largest market share by robotic surgical system installation volume in 2017 and it anticipated to reach robotic surgical system installation volume of 1092 units by 2025. However, Asia-Pacific and Latin America are anticipated to grow at the highest CAGR during the forecast period 2018-2025. This can be attributed to the increasing incidence rate of chronic diseases, technological advancements in the robotic assistive technologies and rising disposable income in these regions. Business expansions and contracts market strategy currently dominate the market, followed by approvals and certifications. Companies also rely heavily on product launches and technological developments in order to sustain their position and to enhance their business strength and outreach. The company Intuitive Surgical is currently holds a strong market position and accounts for approximately 70% of recurring revenues. As per the current market scenario, it is important for the new players to focus on forming strategic partnerships and developing low cost surgical robotics systems that can be used in multiple types surgical procedures. The market has a plethora of opportunities to grow as the demand for minimally invasive cancer procedures is booming. Also, hospitals and clinics are extensively purchasing surgical robots to train their surgical teams. There is a huge addressable market that is still under-penetrated. In the U.S. alone there are more than 3,000 hospitals and 5,000 clinics without any robotic surgery programs. The key players in the global surgical robotics market are Intuitive Surgical Inc., Stryker Corporation, Mazor Robotics, MedRobotics, TransEnterix and Hansen Medical, among others.